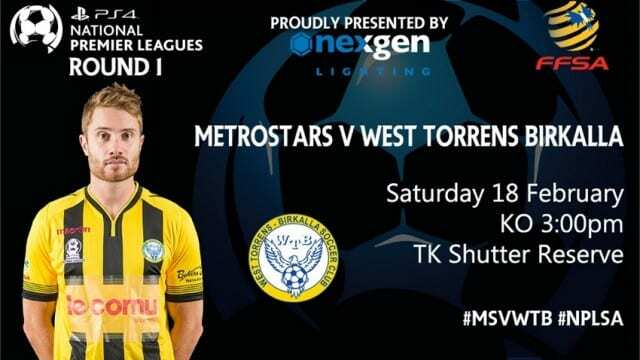 MetroStars kick off the 2017 PlayStation 4 National Premier League South Australia by welcoming West Torrens Birkalla to TK Shutter Reserve in what is sure to be a showcase of fast-paced, end to end football. Having just scraped into the top six after picking up form around the midway point of last season, MetroStars will look to do the reverse this year by getting off to a strong start. In his first full season at the helm, Coach Robbie Saraceno aims to take the Klemzig based club back to the finals for a second time. “Obviously the players were disappointed with how the season ended up finishing last year, getting knocked out in the first round of finals,” he said. “Amongst the playing group there is a burning desire that they want to be back playing finals football. “Last year there was a lot of issues that happened on the park in regards to injuries and suspensions, I think we are pretty confident in the way we have prepared the group. Birkalla will be looking to crack the top two and compete for the Minor Premiership in 2017 after finishing in third place for back to back seasons. The Novar Gardens club were unlucky not to have taken out first place back in 2015 having finished just two points shy, but last season they finished a fair way back as Adelaide City and Campbelltown ran away with the competition. Birkalla goalkeeper Julian Torresan said the team was keen to take that next step this season. “This year we really want to be pushing into the Grand Final if not winning it,” he said. MetroStars have had six players depart over the off-season, with big name signing Travis Dodd announcing his retirement at the end of the season and taking up a spot on the bench alongside Saraceno as his Assistant Coach. Promising youngsters Bailey Truscott and Stefan Simic have signed for rivals Adelaide United and Adelaide Blue Eagles respectively. But the additions of Matthew Dawber and former Western Sydney Wanderers youth product Cohan Morris has Saraceno confident in the squad he has assembled. “I think our squad last year was quite good and this year we have just added to it and I think our depth is a lot better as well,” he said. Metro will also be boosted by the return of Jonathon Negus from injury, and could potentially get a full season out of Christian Esposito for the first time since he returned home to Adelaide. On the flip side, Brikalla Coach Steve De Giovanniello has poached Jake Monaco, Davide Zerillo, Yasmin Sudic and Oliver Zafiridis from their NPL rivals, while he has also raided the State League to find quality players in Hayden Walter, Jordan Spadevecchia and Kristin Konstandopolous. Torresan said that having a deeper squad at their disposal would allow them to be more versatile from a tactical stand point, rather than having to rely on one aspect of the game. “We have a 22 man first team which is quite a big squad now for our club. “We can change our game a little bit now if we want to, if we want to play a more attacking game one week and a more defensive game the next we can,” he said. Saraceno said his side were raring to go after putting in the hard yards on the training track. “It is not going to be the end of the world if it does not happen but our focus will absolutely be to go out there and get the win,” he said. “I think we have prepared ourselves to win and have done everything in our power to get ourselves ready for round 1 and unlike last year we would like to get off to a winning start. Torresan said his side were prepared for a tough game at TK Shutter Reserve. “Everyone want to hit the ground running and get the three points,” he said. “It is always a hard game for us at Metro, it is always a battle when we go there and it is never an easy game.